This fondly-written book had a strange overall effect upon me - it almost made me wish I were religious. This is because Elizabeth was a Salvationist, and her commitment to this organisation is the underlying theme of her story. I have a residual affection for the Sally Army because, in my youth, they still fulfilled a very public role. The women wore basically the same uniform that Elizabeth did so many years beforehand, and undertook fundraising in fleshpots of which they did not approve (pubs). They always seemed very successful, with grizzled old guys with boozer’s noses willingly donating the price of a pint, and accepting a copy of The Warcry in return which, I’m sure, they never read. The Salvation Army bands also used to march and play on Sundays, and were regarded with affection by everybody. I have not seen a Salvationist in decades. As I lolled on the sofa reading this book, with a hedonistic bottle of white wine and snacks to hand, I was struck by the great contrast in my life to Elizabeth’s, and I began to feel distinctly lacking in public spirit, and more than a little exhausted by her energy, commitment and resilience. Sorrow was, of course, no stranger to late Victorian women and Elizabeth was no exception, losing her first husband and a tiny daughter. In her situation, I doubt if I would have decided to return to America alone, where she had briefly lived, but she was in the family of the Salvation Army, so would have had fewer qualms. Unfortunately, she was bumped off the Philadelphia and onto the Titanic. 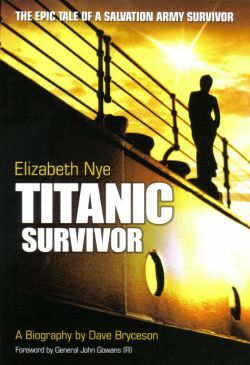 The actual sinking is but a small part of this book, although it does reproduce Elizabeth’s immediate post-sinking account to her parents and some inaccurate, probably embellished, journalistic narratives based on her impressions. She can, however, be credited with having accurately observed the ship breaking in two just before it sank. After the sinking, the widow Elizabeth Nye married fellow-Salvationist George Darby, also an English emigrant to the USA. The book is mostly devoted to their life of service together to their less virtuous, or more unfortunate, fellow human beings, and to that iconic mainstay of the Salvation Army - music. And very interesting it is to those of us who enjoy social history. 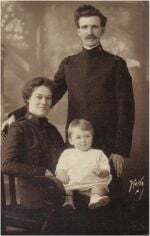 Particularly fascinating are the accounts of the Salvation Army’s early life in Folkestone, where Elizabeth’s father was a leading musical and organisational light. For some reason, the trawlermen of the town, in particular, took great exception to the Army, and accounts of their disagreements lead one to the conclusion that early Salvationists were a good deal tougher then, and not averse to some distinctly physical encounters. Also of interest is the martial structure of the Salvation Army, and the revelation that Elizabeth (a mere foot soldier) could not marry George (a Captain) until she herself had been commissioned an officer, which entailed training at a college. Luckily, she graduated. As a modern woman, living in a reasonably large house, cluttered with electronic devices and domestic appliances, grumbling good-naturedly about the presence of a mere two untidy men, and often deciding against cooking in favour of takeaways, I stand in awe of Elizabeth’s ability to share her home with so many other relatives and lodgers. To make her own bread and cook proper meals for them all; to care for her husband and son; to work for Salvation Army projects and get steadily promoted through the organization; and to make all her own clothes whilst listening to the Victrola or, later, the radio (she doesn’t seem to have much taken to TV in later life). We, today, complain about having to work hard, but I don’t think we pack so much variety and public service into our lives as Elizabeth’s generation did. And I very much doubt if we have so many friends, which may explain Facebook. And that is why, contemplating the dispersed and short-lived nature of today’s relationships, I rather envied Elizabeth’s community and firm beliefs. The character of Elizabeth is somewhat elusive in this book, which is not to criticise the author, who never met her. He has done his best to put human flesh on her bones, but is reliant to an extent on those who knew her when they were children. Their impressions vary with some finding her very approachable, and some finding her rather formidable - as I expect a Victorian lady might seem to a young child in the 1940s. But her progress through life and, to an extent, her character, is well documented by the many photographs. She was a pretty young woman, and I’m sure would have been a very able fund-raiser in the pubs of my youth, had she been around. She was Promoted to Glory in 1963 after a satisfying life, I think, but one over which hovered the terrible experience of April 1912. I like this book very much. Not one for the purely techies, maybe, but one for the many others who are fascinated by the lives of their forebears.